I just bought a new Zonbu computer. 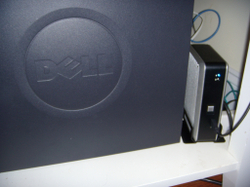 It is the little box behind my Dell desktop. I have a long history on the bleeding edge of technology. I started using an Apple II+ in 1982. The Apple II+ did not even have upper and lower case. I worked at Apple Computer from 1984 to 2004 during which time the vast majority of the world thought the company was going out of business. Since leaving Apple, I have done consulting and used a variety of operating systems, including Windows XP and Linux in various flavors. Mac OS X remains my operating system of choice, but that does not mean that I am one of those died-in-the wool Apple cult members. In fact over at my Applepeels blog someone just accused me of being the following. All your postings are about how you now hate Macs. You're a "reverse switcher" and can no longer claim that you're a Mac user. Fortunately, this is one of those typical Apple folks who immediately assume you hate Apple if you find anything wrong with their products. I suppose my biggest sin was buying a Vista laptop on the eve of Apple shipping their new Leopard operating system. Of course I needed it to get my job done. I have also complained about the pricing and feature set of Apple's Mac mini. My experimenting with Linux has taught me that it is a very capable operating system as long as you have some support not far away. I keep a close eye on the Linux world, and I have remained hopeful that Linux one day might rescue me from Apple & Microsoft. When I heard about Zonbu's $99 Linux desktop mini computer, I decided that even with its $14.95 per month support fee, it was something that I had to try. I ordered one just before Christmas and received it in a couple of days. Setting it up was as easy as plugging in a few cables and typing the password that Zonbu sent me. The computer is all solid state with no moving parts. It boots from a compact flash drive and most of your data is stored online. It comes with all the software you need, overnight shipping of a replacement for three years, and software updates as needed. It is also very energy efficient and completely silent. I think it is the way of the future. I would like to see a better interface put on the storage. It would be great it they also provided you with an email address, but maybe it is best to have your email and your data stored on different servers. So far I have zero complaints. Using Zonbu won't keep me from using Macs and Windows to do some of my more complex graphics work, but it will save me from having to buy some basic computers to do web browsing and email. Firefox is Firefox, and my Gmail and Webmail email accounts work just fine with Zonbu. As a side note, I just started a new blog on news about Carteret County which I also cover with my Southern Outer Banks site. I started the new site because my old one had become a little unwieldy and the .Mac one that I had been trying hasn't shown itself to be very portable unless I haul around 50+ megs of files. I expect to write many of my View from the Mountain posts on my Zonbu. I just need a quieter keyboard. I've been using the Zonbu now for about five months, and blogging about my experiences. It's proven to be a mostly useful, sometimes frustrating, and always interesting experience. As you noted, some things are fully ready for prime time, like the Firefox support, and other things are strangely inconsistent, like the older version of Evolution. 1) Banshee thinks it has a good way to arrange your music. They are wrong. Amarok has it right. Even when I decided I could live with Banshee I hit troubles, the version on the Zonbu has broken playlist code. You can create a playlist, but you cannot re-organize the tracks. Mplayer works fine, but if you make a playlist, it hangs in the middle at random. 2) Most of your music is on-line and takes some time to download track by track, bad if you are listening to a book-on-tape or an album where one track blends into the next. Files keep disappearing on me. Moving files around is a problem. You get messages about files existing or not existing. It's all due to the cache business required for moving files up and down from on-line storage. Try to work around some of these problems by using their Windows tools? They don't work. Try to work around these problems by adding a solid-state external drive ( 16GB CF card USB ) and the OS marks your drive as read-only. Try to work around these problems by making a Zonbu CF card out of that 16GB card, their install script fails for one reason or another. Try to put on a new OS, everything I tried fails for unknown reasons. I have no idea how other people are managing it. It's not like I haven't installed Linux on a PC before. Try to send the damn thing back? Well I spent so much time trying to make it work for me that my 30-days are up and no exceptions.